My work is motivated by the underperformance of American secondary students in school mathematics. My research centers on ways to make authentic mathematics accessible to students, particularly those who have historically been disenfranchised by our educational system. I focus primarily on mathematics teaching in two ways. First, I look at classroom practices that engage the most students in high quality mathematics. Second, viewing teaching as a situated practice, I am interested in how school environments, communities, colleagues, and policies shape what is instructionally possible. My scholarship lies at the intersection of mathematics education, learning sciences, and sociology of teachers' work. My research projects have spanned questions of in-service teachers' professional learning, pre-service education, district level instructional improvement, and students' experiences of different forms of mathematics instruction. These projects implicate the way teachers' work is organized in supporting the best forms of instruction for students. Theoretically, I draw on ethnomethodology and sociocultural studies of learning. Methodologically, I conduct comparative case studies with discourse analysis as a tool to understand local meanings. Supporting Instructional Growth in Mathematics (SIGMa): Enhancing Urban Secondary Teachers’ Professional Learning through Formative Feedback. National Science Foundation. Playful Mathematics Learning: An Exploration of Design, Learning, and Engagement. National Science Foundation (with Melissa Gresalfi, co-PI). Investigating and Supporting the Development of Ambitious and Equitable Mathematics Instruction at Scale. National Science Foundation, Co-Principal Investigator (with Paul Cobb, PI, Kara Jackson, Tom Smith, and Erin Henrick, co-PIs). MIST was an ongoing project that investigating the following question: What does it take to support mathematics teachers' development of ambitious and equitable instructional practices on a large scale? Horn, I.S., Appelgate, M.A., Brasel, J.B., Kane, B.D., & Wilson, J. (Under review). Understanding Access to Expertise in Teachers’ Collaborative Work: An Exploratory Mixed Methods Approach. Data in conversation: Professional learning opportunities in teachers’ data-centered collaborative talk. Spencer Foundation. Principal Investigator. This project examines middle school mathematics teachers’ data-centered workgroup conversations in two urban districts. Student data are central there, as many district schools have not met AYP goals on state assessments. The central question is: How do mathematics teachers’ data-centered collaborative conversations shape professional learning opportunities? Horn, I.S., Kane, B.D., & Wilson, J. (2015, April). Making sense of student performance data: Data use logics and mathematics teachers learning opportunities. American Educational Research Journal. 52(2), 208-242. Urban Teacher Scholars Program: Bridging Theory and Practice for Novice Teachers. Funded by Teachers for a New Era Grant, Carnegie Foundation. Principal Investigator. The project investigated a field-based mathematics methods course, centered on a partnership between a teacher education program and an urban high school mathematics department. It investigated how a configuration bridging the two contexts influence novice teachers’ understandings of of both theory and practice. Horn, I. S., & Campbell, S. S. (2015). Developing pedagogical judgment in novice teachers: mediated field experience as a pedagogy for teacher education. Pedagogies: An International Journal, 10(2), 149-176. Role of multiple contexts in TEP students’ development of teaching identity, interest and commitment to learning to teach. Funded by Teachers for a New Era Grant, Carnegie Foundation. Co-Principal Investigator (with Susan Nolen, PI). This project was a 4-year longitudinal ethnographic study of the development in context of teachers’ identities, motivations, and practices before and after the transition from preservice to inservice. Nolen, S.B, Horn, I.S. & Ward, C.J. (2015). Situating motivation. Educational Psychologist, 50(3), 234 247. Nolen, S.B., Horn, I.S., & Ward, C.J. (2011, January). Assessment tools as boundary objects in novice teachers’ learning. Cognition and Instruction, 29(1), 88-122. Horn, I.S., Nolen, S.B., Ward, C., & Campbell, S.S. (2008). Developing practices in multiple worlds: The role of identity in learning to teach. Teacher Education Quarterly, 61-72. Adaptive Professional Development for High School Mathematics Teachers. “PD3” Project. Funded by the National Science Foundation through the Math-Science Partnership grants under the auspices of the Institute for Advanced Study/Park City Mathematics Institute. Principal Investigator (with James King, co-Principal Investigator). This 6-year university-school partnership brought together mathematicians, mathematics educators, and urban high school mathematics teachers together to improve instruction. We investigated how high school mathematics teachers’ experiences in a rich professional development environment support changes in their classroom practice. Horn, I.S. & Kane, B.D. (2015). Opportunities for professional learning in mathematics teacher workgroup conversations: Relationships to instructional expertise. Journal of the Learning Sciences. 24(3), 373-418. Hall, R.P. & Horn, I.S. (2012). Talk and conceptual change at work: Analogy and epistemic stance in a comparative analysis of statistical consulting and teacher workgroups. Mind, Culture, Activity, 19(3), 240-258. Horn, I.S. (2008, June). The inherent interdependence of teachers. Phi Delta Kappan, 751-754. Examining the Contexts and Practices of Effective High School Algebra Teachers. Funded by the American Educational Research Association Postdoctoral Fellowship. Principal Investigator (with the sponsorship of Jo Boaler). I examined the experiences of students whose prior preparation did not optimally position them for success in mathematics class. I identified 4 students in two different high schools who had in some way “turned around” their mathematical achievement and followed their progress over their four years of high school. Horn, I.S. (2006, Winter). Lessons learned from detracked mathematics departments. Theory into Practice, 45(1), 72-81. Horn, I.S. (2008). Turnaround students in high school mathematics: Constructing identities of competence through mathematical worlds. Mathematical Thinking and Learning, 10(3), 201-239. Teachers’ Professional Development in the Contexts of High School Reform. Funded by the Spencer and MacArthur Foundations. 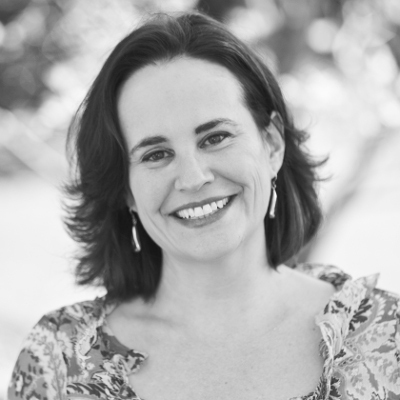 Judith Warren Little, Principal Investigator. A two-year qualitative study of mathematics and English teachers in two urban comprehensive high schools investigated how teacher community serves as resource for teacher development and school reform. Horn, I.S. (2005). Learning on the job: A situated account of teacher learning in high school mathematics departments. Cognition & Instruction, 23(2), 207-236. Horn, I.S. (2007). Fast kids, slow kids, lazy kids: Framing the mismatch problem in math teachers’ conversations, Journal of the Learning Sciences, 16(1), 37-79. Horn, I.S. (2017). 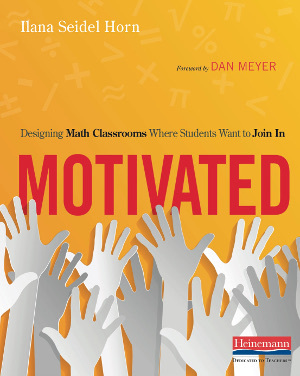 Motivated: Designing Math Classrooms Where Students Want to Join In. Portsmouth, NH: Heinemann. Horn, I.S. (2012). 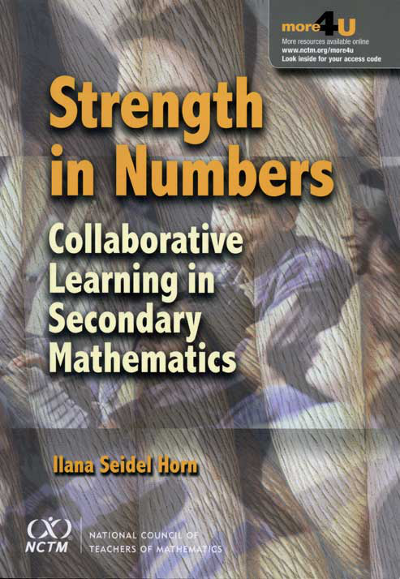 Strength in Numbers: Collaborative Learning in Secondary Mathematics. Reston, VA: National Council of Teachers of Mathematics. ...and follow me on Twitter.